Home › Medianism › Is High CEO Pay Good For The Median? Is High CEO Pay Good For The Median? Steven Ballmer announced today that he would retire. 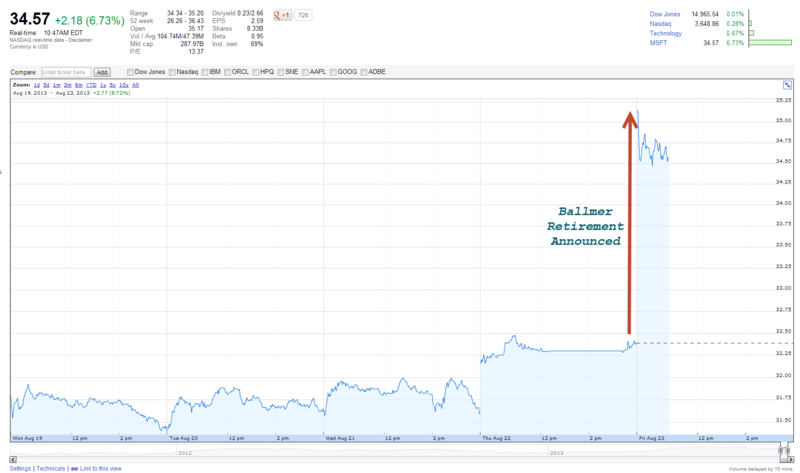 Microsoft stock shot up immediately …an increase in value of about $18 billion dollars. Of course that’s embarrassing for Ballmer but the lesson cuts both ways. If Ballmer’s exit and replacement with an unknown is worth $18 billion then hiring the right CEO at $27 million annually, the average annual pay for the 100 highest paid CEOs in America, looks like a bargain. Small differences are a big deal for large corporations, you know like a marginal… something or other. This is a striking market shift. It is true that the markets seem to have judged Ballmer to be such a failure that anyone that Microsoft could hire to replace him is preferred to the tune of $18 billion. But Tabarrock implies that the $18 billion market judgement is evidence of the marginal productivity of CEOs. That isn’t true. The $18B is evidence of the coercive power of a CEO, not his productivity. The investors who own Microsoft have judged that Ballmer’s presence has been suppressing the stock value by $18Bb, but the owners have not been able to do anything about it. Instead of firing Ballmer, the owners of Microsoft have been forced to wait until he voluntarily quit. A CEO’s job is clearly important because it is the embodiment of tremendous coercive power, but it isn’t clear how much a CEO actually produces for the organization because we cannot measure a CEO’s production independently of the organization. A CEO can always suppress stock value just like a terrorist could blow up a company’s stock value. A CEO may even have the power to drive a company bankrupt, but that is not a measure of CEO productivity. It is a measure of coercive power. Because of the power inherent in the position of CEO, it is crucial to get a productive person in the job, but there is no evidence that it takes millions of dollars get a productive CEO. Ballmer is an excellent example of this. Shareholders should have been willing to pay Ballmer billions of dollars to quit, but instead of cutting his salary, they have been paying him around $1,377,000 per year to stay in the job. Why have they been paying him millions over the years if they think he is subtracting billions of dollars from Microsoft profits? CEO’s like Ballmer extract money from companies like a terrorist would. They use their coercive power to extract wealth. Tabarrock implies that the Microsoft CEO must have a marginal productivity worth at least $18B, but his work would be worth nothing without the other people at Microsoft working under his power. Every single job in a large organization could be claimed to have extremely high marginal productivity because all jobs are interdependent within an organization. Similarly all the organs of your body are interdependent and each organ could claim that they actually produce the majority of your body’s marginal productivity. Your brain could claim that it has tremendous marginal productivity because without your brain, your body is unproductive. But the same could be said for your heart, liver, skin, bones, or any other major organ. No organ gets paid more resources than the very minimum it needs to function. The different parts of the body of a large corporation work together in the same way. If any job consistently fails to get done, the organization gets sick and is likely to die. For example, if a mid-level Microsoft accountant went on strike, and nobody else was allowed to do his job, he could easily suppress Microsoft stock by $18B. That never happens because no accountant has enough power to neglect his duties without someone else stepping in, but it is only the fact that the accountant does not have the power of a CEO to sabotage the organization that prevents the stock value from suddenly changing $18B when an accountant quits. If the janitors at Microsoft had the power to keep anyone else from doing their work, then the janitors could cause Microsoft stock to fall. It would be hard to get good employees to work in unclean offices with unsanitary bathrooms. Customers would shy away too. But janitors don’t have the power to sabotage the company like a CEO can. So the fact that CEOs produce bigger stock movements janitors is not because CEOs are more productive than the janitors. It is because the janitors (and accountants, etc.) don’t have enough coercive power in the organization to be able to sabotage Microsoft stock values. Tabarrock’s mention of “marginal… something or other” is a reference to the marginal productivity theory of wages. That theory has a long history of use to justify inequality. CEOs and other elites love marginal productivity theory because it claims that people are paid exactly what they are contribute to society. So CEOs must contribute a lot if they are paid a lot. That theory is wrong, but even if it were correct, it would mean that people create zero net value for society at the margin. The true lesson of marginal productivity theory should be that the only way to contribute to society is to produce more than you are paid. The true measure of your value to society is how much you give, not how much you receive. If there was evidence that enormous American CEO pay gives benefit to the median American (by increasing productivity spillovers), then I would be all for it, but nobody has even tried to show evidence to support that idea. Inequality is only good if it produces good results for non-elites too. Elites already have natural tendency to think they are superior to the rest of us. Don’t inflate their sense of entitlement with fantasies of immense productivity that justifies inequality and increases corruption.